Is it really June 18? It’s cold here…well it’s in the 60’s. My feet get cold at night when it dips below 70. So here it is, supposedly 2 days from summer starting, and I have to wear socks to bed. Yesterday, it was so hot and muggy that I was wearing shorts and a t-shirt. When I woke up this morning I was freezing. It’s either hot or cold…hot or cold…hot or cold…. 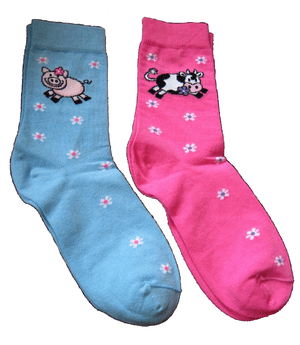 If my socks were as cute as yours, and it wasn’t as HOT as the hinges of Hades I’d wear socks to bed, too. I am trying to decide whether this is too much information. Nah, it’s OK. Sometimes I wear socks to bed also. Welcome to the world news Weather..
We had 4 AMAZING Hot days..Then 2 days of cold and rain.. Craziness this season so far. We turned on the A/C because it was so darn humid and then the temperatures plunge. We turn off the A/C and the humidity goes crazy…..
yes, I’ve used the heat and the air conditioning in the same day! LOL thanks Courtney, yes a lot of people express themselves with fun socks! or sox!